2. They must complete a training and certification course. 3. Mandatory topics must be covered. 4. An evaluation of the training and the operators understanding of the material. 5. A hands-on evaluation must be performed by a designated evaluator. 6. Training must be equipment specific. 7. Training must be site specific. 8. OSHA can and will levy fines of up to $7,000 for every operator that is not trained and certified under the guidelines. 1. They can hire a 3rd party safety consultant to conduct on-site training. 2. Employees can be sent off-site. 3. In-house training and certification can be developed. 4. Online train the trainer certification is now available and accepted by OSHA. Many companies find that hiring an expensive consultant to do on-site or off-site training to be expensive and disruptive to operations. In addition, if an owner or manager is willing to take the training first to decide if it is a fit for their company, they can’t be sure that the training is right for their business or employees. • Is online forklift certification legit? • How long does forklift certification last? • I’m not sure how to get forklift certification. Where do I turn? Q: What is forklift certification? 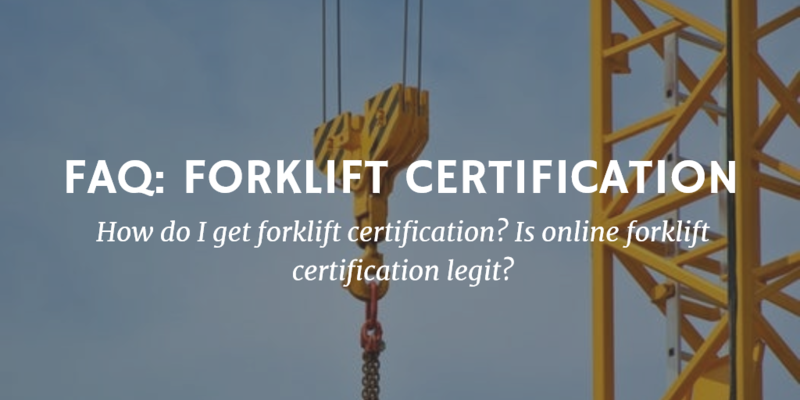 Q: Is online forklift certification legit? A: All of our training certification programs from ForkliftCertification.com include up-to-date training info, and are highly recommended for any company or individual driver looking to achieve compliance. Q: Where can I get forklift certification? A: The answer is simple: at ForkliftCertification.com! Our three different training packages are ideal for beginners, veteran forklift drivers, and everyone in between. For more information, check out our helpful article on this subject! Q: How long does forklift certification last? A: Forklift certification lasts for three years. ForkliftCertification.com offers easy renewal training. Whenever you need renewal training, we’re here to assist with any questions you have! Q: How do I renew my forklift certification? A: Once your training has expired, you can complete the online training on our website, or access the hands-on evaluation to complete your training. It’s that simple! Our easy renewal training is just one reason why we’re a trusted provider of OSHA compliant forklift training. Q: Is forklift certification required? A: According to OSHA standard 29 CFR 1910.178, is it mandatory that anyone operating a forklift in the United States is required to have certification training. This is one of OSHA’s most well-known rules and regulations, which falls under their Powered Industrial Truck training requirements. If you or your company are involved in an accident and no training records are provided, OSHA will hand down hefty fines and penalties. Keep in mind, employers are responsible for providing OSHA compliant training for all employees that operate a forklift! Q: Is forklift certification worth it? A: We’ll answer this question in two parts. ForkliftCertification.com forklift training is worth it from a safety standpoint; we think avoiding accidents and injuries is worth it – and we think you’ll agree. But our training is also worth it financially, too. Employers want to hire the most qualified forklift drivers. With OUR OSHA approved training, you have a better chance at landing a well-paying forklift job. Because of the simple access and low cost, many employers are now choosing online train the trainer certification and training. Online training provides all the benefits of on-site training as well as the opportunity for managers to view the topics required by OSHA and content to ensure it is right for their company. And to prevent these kinds of forklift accidents from happening. To learn more about our forklift certification programs, give us a call today at (888) 278-8896. If you’re ready to get started, sign up today! Thanks for visiting ForkliftCertification.com!